From a construction cost stand-point, the improvements you are proposing are very affordable since the main infrastructure already exists. Even the addition of a few traffic mirrors at the sharp bends would help bicyclists, joggers, and vehicles see what’s coming around the turn. The old train car station (currently abandoned), would be a great place for a small cafe/bar (pit-stop) along the Jones Falls Trail. Bike Boulevard’s are relatively inexpensive infrastructure. I believe you are referring to the building inscribed with Maryland Pennsylvania Railroad. What you suggest for that building is a great idea! This seems like a great solution/improvement. I wish we had some in Durham, NC. What would need to happen to take your idea from here to ribbon cutting? Perhaps posting a chain list of the necessary and supporting organizations would be a good way of finding allies? Good work! Bike Boulevard’s are starting to make their way to the US and don’t be surprised to see some in NC. Bike Boulevard’s and their cousin “The Woonerf” are common in northern Europe. I have been advocating this for years now. The most brilliant thing about this is that as a commuter route, practically the whole thing is downhill all the way in to midtown from Hampden, Woodberry, Medfield, Stone Hill, and the like so you’re not all sweaty when you get to work. With the development of Mill No. 1, Union Mill, Clipper Mill, and the Grand Rotunda we are going to need much more bike and pedestrian infrastructure cause there is no room left for cars. Yes, the Jones Falls Valley and some of the adjacent neighborhoods to the valley are really starting to take off. 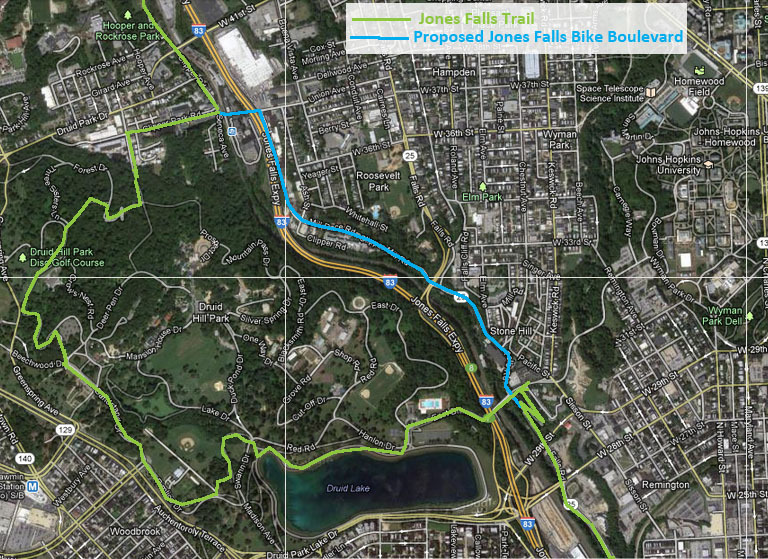 Jacques Kelly writes about it in his article “Unlocking the mysteries of the Jones Falls Valley” It would be great to safely bike in between all these areas. I am sorry but you are delusional. Incredibly short sight-lines (<10 ft in places) & tight corners, narrow lanes, and immovable objects (rocks, buildings) right up to and over-hanging the roadway are the dangers of this stretch of road. Mirrors and speed-bumps can not over-come these dangers. This stretch of road is the reason 83 was constructed. A few hardy commuters and bikers (myself included) may indulge this risk, but we are totally naive to pretend it can be done safely. I can not in good conscience recommend anyone bike on this stretch of road.